The key is a tool that unlocks physical barriers: doors, gates, diaries and safes. The key is also a metaphorical symbol for much more. A key can open the door to a loved one’s heart. A key can give access to a lifelong dream. A key can free the imagination from restraints. 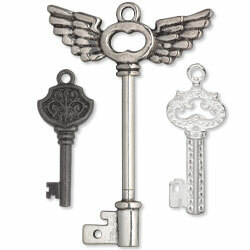 The inherent mystery of the key has made it a popular choice for jewelry design. Tiffany and Co. have a large collection of keys, and celebrities such as Taylor Swift and Jessica Biel have been seen wearing key pendants. The key can be the perfect piece for a number of occasions. 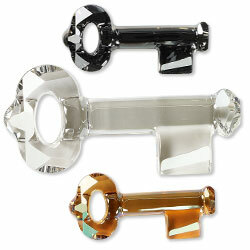 A Valentine’s Day key can signify love and affection. A wedding day key might be a symbol of trust between soul mates. A Mother’s Day key could represent the precious memories a mother keeps eternally locked in her heart. An excellent design element for this trend is the Swarovski crystal key-shaped pendant. The faceted crystal pendant was designed by renowned artist Yoko Ono in collaboration with Swarovski, and is available in two sizes and a number of color choices. JBB Findings has created a specialized bail for the Swarovski pendant. The bail fits perfectly around the head of the key and crimps at the neck, which allows the key to always be facing outward. Also, choose from a large selection of key-shaped focals and pendants with a variety of finishes.